Protection of war wounded, refugees, and prisoners. The International Committee of the Red Cross (ICRC) is a private humanitarian organisation based in Geneva, Switzerland. It is the oldest organisation within the International Red Cross and Red Crescent Movement and one of the most widely recognized organisations in the world. It is also the most honoured. The ICRC has won three Nobel Peace Prizes; in 1917, 1944, and 1963. Up until the middle of the 19th century, there was no organized army nursing for casualties and no way safe place to house and treat the injured soldiers. Swiss businessman Henry Dunant saw the Battle of Solferino, in the Austro-Sardinian War. The battle only lasted one day, but about 40,000 soldiers on both sides were killed or were left severely hurt on the battlefield. Dunant was shocked by the suffering of the wounded soldiers, and the lack of medical help. He cancelled his trip to see Emperor Napoleon III and spent several days helping to treat and care for the wounded. He wrote a book about what he saw, called A Memory of Solferino. he published it with his own money in 1862, and sent copies of the book to leading political and military figures throughout Europe. The book did not only describe what Dunant saw, but called for the setting up of national voluntary relief organisations to help nurse wounded soldiers in the case of war. Dunant also called for international treaties to guarantee the neutrality and protection for the wounded and for medics and field hospitals. Original document of the first Geneva Convention, 1864. Guillaume Henri Dufour, a general of the Swiss Army. The committee soon changed its name to the "International Committee for Relief to the Wounded". In October 1863, the international conference it organised took place in Geneva to talk about improving medical services on the battle field. The introduction of a protection symbol for medical personnel in the field. They chose a white armband bearing a red cross. Memorial commemorating the first use of the Red Cross symbol in an armed conflict during the Battle of Dybbøl (Denmark) in 1864; jointly erected in 1989 by the national Red Cross societies of Denmark and Germany. Only one year later, the Swiss government invited the governments of all European countries, as well as the United States, Brazil, and Mexico, to attend an official diplomatic conference. Sixteen countries sent a total of twenty-six delegates to Geneva. On 22 August 1864, the conference adopted the first Geneva Convention "for the Amelioration of the Condition of the Wounded in Armies in the Field". Representatives of 12 states and kingdoms signed the convention: Baden, Belgium, Denmark, France, Hesse, Italy, the Netherlands, Portugal, Prussia, Switzerland, Spain, and Württemberg. The convention contained ten articles, establishing for the first time legally binding rules guaranteeing neutrality and protection for wounded soldiers, field medical personnel, and specific humanitarian institutions in an armed conflict. The national government of the respective country must have signed the Geneva Convention. The first national societies were founded in Belgium, Denmark, France, Oldenburg, Prussia, Spain, and Württemberg. Also in 1864, Louis Appia and Charles van de Velde, a captain of the Dutch Army, became the first independent and neutral delegates to work under the symbol of the Red Cross in an armed conflict. Three years later in 1867, the first International Conference of National Aid Societies for the Nursing of the War Wounded was convened. Dunant left the committee in 1867 after arguing with other members. In 1876, the committee changed its name to the"International Committee of the Red Cross" (ICRC), which is still its official name today. Five years later, the American Red Cross was founded through the efforts of Clara Barton. More and more countries signed the Geneva Convention and began to respect it in practice during armed conflicts. The Red Cross quickly became an internationally respected movement, and the national societies became increasingly popular as a venue for volunteer work. When the first Nobel Peace Prize was awarded in 1901, the Norwegian Nobel Committee opted to give it to Henry Dunant and Frédéric Passy, a leading campaigner against war. The International Committee of the Red Cross officially congratulated Dunant and was a tribute to his key role in the formation of the Red Cross. Dunant died nine years later in the small Swiss health resort of Heiden. Only two months earlier his former friend and committee member Gustave Moynier had also died. By the start of the First World War in 1914, there were 45 national relief societies throughout the world. The movement had grown beyond Europe and North America to Central and South America (Argentina, Brazil, Chile, Cuba, Mexico, Peru, El Salvador, Uruguay, Venezuela), Asia (the Republic of China, Japan, Korea, Siam), and Africa (Republic of South Africa). The Geneva Convention had been changed to include fighting at sea as well as on land. French postcard celebrating the role of Red Cross nurses during the First World War, 1915. In World War I Red Cross nurses came from around the world, including the United States and Japan, came to help the medical services of the armed forces of the countries involved in the war in Europe. On 15 October 1914, immediately after the start of the war, the ICRC set up its International Prisoners-of-War (POW) Agency. By the end of the war, the Agency had sent about 20 million letters and messages, 1.9 million parcels, and about 18 million Swiss francs to POWs of all affected countries. The Agency also arranged for about 200,000 prisoners to be released and returned to their home country. The Agency collected about 7 million records from 1914 to 1923 about prisoners or missing people. The card index helped to identify about 2 million POWs and to contact their families. The complete index of 7 million cards is on loan from the ICRC to the International Red Cross and Red Crescent Museum in Geneva. But only ICRC can search the index. The ICRC got the only Nobel Peace Prize of the war years, in 1917, for its outstanding wartime work. In 1923, the Committee changed its membership rules. Until then, only citizens of the city of Geneva could serve in the Committee. This was changed to include all citizens of Switzerland by birth. This is still the rule today, and is designed to show that the ICRC is neutral, and that committee members and workers have never been citizens of a country that might be involved in a war. Only in 1993 were non-Swiss-born people allowed to work for the committee. Red Cross message from Łódź, Poland, 1940. In 1934 the ICRC tried to get extra protection for civilians during war. Unfortunately most governments were not interested in adopting the extra rules before the start of World War II. administering the exchange of messages regarding prisoners and missing persons. By the end of the war, 179 delegates had conducted 12,750 visits to POW camps in 41 countries. The Central Information Agency on Prisoners-of-War (Zentralauskunftsstelle für Kriegsgefangene) had a staff of 3,000, the card index tracking prisoners contained 45 million cards (more than 6 times as many as world war 1), and 120 million messages were exchanged by the Agency. The German Red Cross was controlled by the Nazis, and would not uphold the Geneva conventions which may have helped stop the deportation of Jews from Germany and the mass murders conducted in the concentration camps run by the German government. Two other main countries in the war, the Soviet Union and Japan, were not party to the 1929 Geneva Conventions and were not legally required to follow the rules of the conventions. Thus, other countries were not bound to follow the Conventions regarding their prisoners in return. The ICRC had to stop complaining about the treatment of detainees in concentration camps in case the ICRC was stopped from working for POWs. After November 1943, the ICRC could send parcels to concentration camp detainees with known names and locations. Because the notices of receipt for these parcels were often signed by other inmates, the ICRC managed to register the identities of about 105,000 detainees in the concentration camps and delivered about 1.1 million parcels, mostly to the camps Dachau, Buchenwald, Ravensbrück, and Sachsenhausen. Marcel Junod, delegate of the ICRC, visiting POWs in Germany. On 12 March 1945, ICRC president Jacob Burckhardt was told by SS General Ernst Kaltenbrunner that the ICRC's delegates could visit the concentration camps, but the delegates would have to stay in the camps until the end of the war. Ten delegates, among them Louis Haefliger (Camp Mauthausen), Paul Dunant (Camp Theresienstadt) and Victor Maurer (Camp Dachau), visited the camps. Louis Haefliger told American troops about the forceful eviction or blasting of Mauthausen-Gusen and saved the lives of about 60,000 inmates. His actions were condemned by the ICRC because they were deemed as acting unduly on his own authority and risking the ICRC's neutrality. Only in 1990, his reputation was finally rehabilitated by ICRC president Cornelio Sommaruga. Another example of great humanitarian spirit was Friedrich Born (1903-1963), an ICRC delegate in Budapest who saved the lives of about 11,000 to 15,000 Jewish people in Hungary. Marcel Junod (1904-1961), a doctor from Geneva, was another famous delegate during the Second World War. He was one of the first foreigners to visit Hiroshima after the atomic bomb was dropped, and wrote his thoughts in his book Warrior without Weapons. In 1944, the ICRC got its third Nobel Peace Prize. The ICRC Headquarters in Geneva. On 12 August 1949, the existing two Geneva Conventions were changed, and the Hague Convention about casualties at sea was brought into the Geneva Convention "family". It was renamed the Second Geneva Covention, and so the second convention of 1929 is now called the third convention. The Fourth Geneva Convention, about the "Protection of Civilian Persons in Time of War," was established. On 8 June 1977 extra article "protocols" were added to make the conventions apply to internal conflicts such as civil wars. In 1963, the ICRC shared its third Nobel Peace Prize with the League of Red Cross Societies. Since 1993, non-Swiss citizens have been allowed to serve as Committee delegates abroad, a task which was previously restricted to Swiss citizens. Now about one third of staff are not Swiss citizens. On 16 October 1990, the UN General Assembly gave the ICRC observer status for its assembly sessions and sub-committee meetings, the first observer status given to a private organization. The resolution was jointly proposed by 138 member states and introduced by the Italian ambassador, Vieri Traxler, in memory of the organization's origins in the Battle of Solferino. 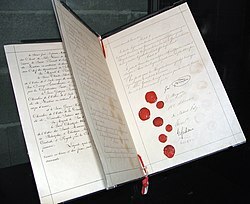 An agreement with the Swiss government signed on 19 March 1993, affirmed the already long-standing policy of full independence of the Committee from any interference by Switzerland. The agreement protects the full sanctity of all ICRC property in Switzerland including its headquarters and archive, grants members and staff legal immunity, exempts the ICRC from all taxes and fees, guarantees the protected and duty-free transfer of goods, services, and money, provides the ICRC with secure communication privileges at the same level as foreign embassies, and simplifies Committee travel in and out of Switzerland. The ICRC continued its activities throughout the 1990s. It broke its usual silence when it denounced the Rwandan Genocide in 1994, and again in 1995 about the crimes that happened in and around Srebrenica when it said, "We must acknowledge that despite our efforts to help thousands of civilians forcibly expelled from the town and despite the dedication of our colleagues on the spot, the ICRC's impact on the unfolding of the tragedy was extremely limited." It went public once again in 2007 to decry "major human rights abuses" by Burma's military government including forced labor, starvation, and murder of men, women, and children. Frédéric Maurice. He died on 19 May 1992 at the age of 39, one day after a Red Cross transport he was escorting was attacked in the former Yugoslavian city of Sarajevo. Fernanda Calado (Spain), Ingeborg Foss (Norway), Nancy Malloy (Canada), Gunnhild Myklebust (Norway), Sheryl Thayer (New Zealand), and Hans Elkerbout (Netherlands). They were murdered at point-blank range while sleeping in the early hours of 17 December 1996 in the ICRC field hospital in the Chechen city of Nowije Atagi near Grozny. Their murderers have never been caught and there was no apparent motive for the killings. Rita Fox (Switzerland), Véronique Saro (Democratic Republic of Congo, formerly Zaire), Julio Delgado (Colombia), Unen Ufoirworth (DR Congo), Aduwe Boboli (DR Congo), and Jean Molokabonge (DR Congo). On 26 April 2001, they were en route with two cars on a relief mission in the northeast of the Democratic Republic of Congo when they came under fatal fire from unknown attackers. Ricardo Munguia (El Salvador). He was working as a water engineer in Afghanistan and travelling with local colleagues when their car was stopped by unknown armed men. He was killed execution-style at point-blank range while his colleagues were allowed to escape. He died at the age of 39. Vatche Arslanian (Canada). Since 2001, he worked as a logistics coordinator for the ICRC mission in Iraq. He died when he was travelling through Baghdad together with members of the Iraqi Red Crescent. Their car accidentally came into the cross fire of fighting in the city. Nadisha Yasassri Ranmuthu (Sri Lanka). He was killed by unknown attackers on 22 July 2003 when his car was fired upon near the city of Hilla in the south of Baghdad. The original motto of the International Committee of the Red Cross was Inter Arma Caritas ("Amidst War, Charity"). It has preserved this motto while other Red Cross organizations have adopted others. Because Geneva is in the French-speaking part of Switzerland, the ICRC is also known under its French name Comité international de la Croix-Rouge (CICR). However, the ICRC has six official languages, including Arabic. 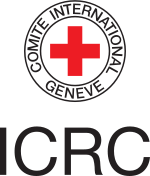 The official symbol of the ICRC is the Red Cross on white background (the inverse of the Swiss flag)with the words "COMITE INTERNATIONAL GENEVE" circling the cross. The 2005 budget of the ICRC was about 970 million Swiss francs. All payments to the ICRC are voluntary and are received as donations based on two types of appeals issued by the Committee: an annual Headquarters Appeal to cover its internal costs and Emergency Appeals for its individual missions. Most of the ICRC's funding comes from Switzerland and the United States, with the other European states and the E.U. close behind. Together with Australia, Canada, Japan, and New Zealand, they contribute about 80-85% of the ICRC's budget. About 3% comes from private gifts, and the rest comes from national Red Cross societies. The ICRC is responsible for legally recognizing a relief society as an official national Red Cross or Red Crescent society and thus accepting it into the Movement. The exact rules are in the statutes of the Movement. After recognition by the ICRC, a national society is admitted as a member to the International Federation of Red Cross and Red Crescent societies. The ICRC and the Federation cooperate with the individual national societies in their international missions, especially with human, material, and financial resources and organizing on-site logistics. According to the 1997 Seville Agreement, the ICRC is the lead Red Cross agency in conflicts while other organizations within the Movement take the lead in non-war situations. National societies will be given the lead especially when a conflict is happening within their own country. The ICRC headquarters are in Geneva, Switzerland. It has other offices, called Delegations, in about 80 countries. Each delegation is under the responsibility of a Head of delegation who is the official representative of the ICRC in the country. Of its 2,000 professional employees, roughly 800 work in its Geneva headquarters and 1,200 expatriates work in the field. About half of the field workers serve as delegates managing ICRC operations in the different countries while the other half are specialists like doctors, agronomists, engineers or interpreters. The international staff are assisted by some 13,000 national employees, so about 15,000 people work for the ICRC. The Directorate is the executive body of the Committee.It carries out the policies set by the assembly. The Directorate consists of a Director-General and five directors in the areas of "Operations", "Human Resources", "Resources and Operational Support", "Communication", and "International Law and Cooperation within the Movement". The members of the Directorate are appointed by the Assembly to serve for four years. The Director-General has assumed more personal responsibility in recent years, much like a CEO, where he was formerly more of a first among equals at the Directorate. The Assembly (also called the Committee) convenes on a regular basis and is responsible for defining aims, guidelines, and strategies and for supervising the financial matters of the Committee. The Assembly has a membership of a maximum of 25 Swiss citizens. Members must speak the house language of French, but many also speak English and German as well. These Assembly members are co-opted for a period of four years, and there is no limit to the number of terms an individual member can serve. A three-quarters majority vote from all members is required for re-election after the third term, which acts as a motivation for members to remain active and productive. In the early years, every Committee member was Genevan, Protestant, white, and male. The first woman, Renée-Marguerite Cramer, was co-opted in 1918. Since then, several women have attained the Vice Presidency, and the female proportion after the Cold War has been about 15%. The first non-Genevans were admitted in 1923, and one Jew has served in the Assembly. While the rest of the Red Cross Movement many be multi-national, the Committee believes that its mono-national nature is an asset because the nationality in question is Swiss. Thanks to permanent Swiss neutrality, conflicting parties can be sure that no one from "the enemy" will be setting policy in Geneva. The Franco-Prussian War of 1870-71 showed that even National Red Cross Societies can be biased and not maintain neutral humanitarianism. Jakob Kellenberger, current president of the ICRC. Furthermore, the Assembly elects a five-member Assembly Council that constitutes an especially active core of the Assembly. The Council meets at least ten times per year and has the authority to decide on behalf of the full Assembly in some matters. The Council is also responsible for organizing the Assembly meetings and for helping communication between the Assembly and the Directorate. The Assembly Council normally includes the president, two vice presidents and two elected members. While one of the vice presidents is elected for a four-year term, the other is appointed permanently with his tenure ending by retirement from the vice presidency or from the Committee. Currently Jacques Forster and Olivier Vodoz are vice presidents. In April 2007, Christine Beerli was appointed to succeed Jacques Forster from the beginning of 2008. The Assembly also selects, for a term of four years, one individual to act as President of the ICRC. The president is both a member of the Assembly and leader of the ICRC, and he has always been included on the Council since its formation. The President automatically becomes a member of the assembly and the ICRC once he is appointed, but he does not necessarily come from within the ICRC organization. There is a strong faction within the Assembly that wants to reach outside the organization to select a president from the Swiss government or professional circles like the banking or medical fields. In fact, the last three presidents were previously officials in the Swiss government. The president's influence and role is not well-defined, and changes depending upon the times and each president's personal style. Since 2000, the president of the ICRC has been Jakob Kellenberger. Kellenberger does not make many public appearances or statements but is good at personal negotiation promoting the ICRC privately. In February 2007, he was appointed by the Assembly to another four-year term which will run until the end of 2011. The Nobel Peace Prize ceremony in 1963 when the prize was jointly awarded to the ICRC and the Federation. From left to right: King Olav of Norway, ICRC President Leopold Boissier, League Chairman John MacAulay. The ICRC tends to work quietly and not attract publicity, unlike some other aid agencies. This way it was been able to get access to, for example, Nelson Mandela, when he was still a prisoner of the apartheid government of South Africa. ↑ ICRC. 2005. ICRC 2004 Annual Report (Headquarters section). 35. ↑ ICRC. 2005. ICRC 2004 Annual Report (Headquarters section). 32. ↑ "The Story of My Childhood". World Digital Library. 1907. Retrieved 2013-10-10. ↑ Mégevand-Roggo, Béatrice. Srebrenica – remembering the missing. 5 July 2005. ↑ David P Forsythe, The Humanitarians: The International Committee of the Red Cross, (Cambridge, NY:Cambridge University Press, 2005), 161. ↑ Forsythe, The Humanitarians, 233. ↑ Forsythe, The Humanitarians, 225. ↑ Forsythe, The Humanitarians, 203-6. ↑ Forsythe, The Humanitarians, 208. ↑ Bugnion, La Protection, 1138-41. ↑ ICRC. 9 Dec 2005. New ICRC vice-president. ↑ ICRC. 1 Jan 2006. ICRC presidency. ↑ Forsythe, The Humanitarians, 211. ↑ Forsythe, The Humanitarians, 219. Favez, Jean-Claude (1999). The Red Cross and the Holocaust. Cambridge, UK: Cambridge University Press. ISBN 0-521-41587-X. Legacy Dr. Cornelio Sommaruga, President of the ICRC from 1987-1999, donated four hours of high-definition audiovisual life story interviews to Legacy. The ICRC audiovisual library houses copies of these interviews. This page was last changed on 9 December 2018, at 09:49.